In the eCommerce world, “holidays” pretty much always means the period between Black Friday and Christmas. And that makes sense–almost 20 percent of retail sales for the year come during that stretch, and for some businesses it’s more like 30 percent. Of course, the November to December holidays are not the only ones that exist in the eCommerce world (or, obviously, the world at large). 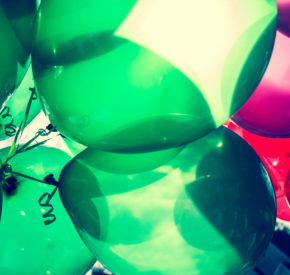 According to the National Retail Federation, there are eight other holidays where people spend big, anywhere from an average of $37.92 on St. Patrick’s Day up to an average of $186.39 on Mother’s Day. But even beyond those, there are plenty of additional holidays throughout the year that are also good opportunities for your business. That includes “official” but less prominent holidays like Groundhog Day and President’s Day… and more obscure holidays like National Coffee Day and Thank a Mailman Day that probably started as a marketing gimmick. 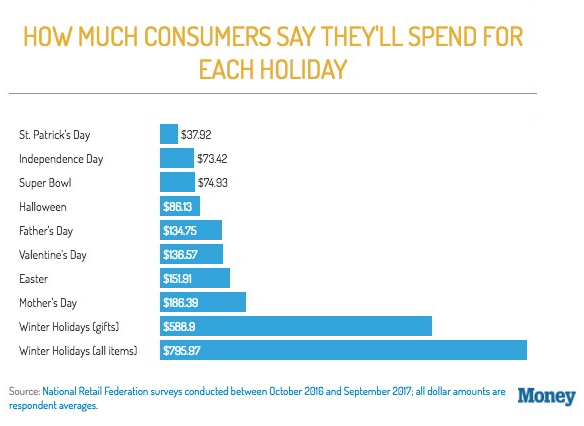 Those days might not be considered traditional retail holidays like the ones featured in the graph above, but they can still provide excellent email marketing opportunities. They give you a trigger and a purpose for sending a marketing email. One of the ways to curb your fears that you’re angering your subscribers by sending too many emails is to make sure each of your emails has a purpose–and a holiday, even an uncommon one, certainly counts as a viable and justifiable purpose. They give you a good opportunity to offer a sale. We have lots of examples later in this post of brands crafting sales–often very clever, thematic ones–around holidays. There’s even one case where a brand offers a small discount of just 3.14 percent off–but since it’s tied to the holiday so well, it doesn’t feel weak. They give you a chance to be topical. Sending emails focused on holidays shows you’re not just blasting out generic or repetitive content. They give you an opportunity to show off your brand’s personality. No one thinks National Crunchy Taco Day (October 4th, by the way) should be taken seriously or shown proper reverence. So your approach to your email marketing surrounding the day can show some humor–or play up whatever is the personality and vibe of your brand. Let’s start by looking into how to plan an email campaign around an obscure holiday, and then dig into some examples of how brands have leveraged Groundhog Day, National Dog Day, Oktoberfest, and many more into successful marketing opportunities. While almost every brand plans some sort of email promotion for the biggest holidays on the calendar, fewer take advantage of non-traditional holidays. There are many (many, many, many) to choose from, and while the process is similar to planning for Black Friday or Christmas, there are some differences. Here are four steps you should follow to make sure your non-traditional holiday email marketing campaign goes off without a hitch. 1. Find the holidays that fit best with your brand. You can’t send a marketing email for every National Whatever Day; there are now literally multiple “holidays” every day. So your top priority is finding the handful of days that are directly connected to what you do. If you sell beer memorabilia, you’re not going to want to miss International Beer Day in August or American Beer Day in October. If you sell video games, you’ll circle National Video Games Day in July, and perhaps National Mario Day in March. Here, a company that sells baking tools used National Pancake Day as an opportunity to send a marketing email promoting a sale. It’s not hard to see why pancakes are a good match for a baking supply company. Check out sites like Holiday Insights, Time and Date, and National Today for all of those obscure holidays, and also this list of all the “official” U.S. national and state holidays. 2. Figure out other holidays you want to celebrate, and come up with good tie-ins to those days. Even if a holiday isn’t a perfect fit for your business, there are still plenty of ways you can market around it. As long as your brand is connected enough to the holiday that your customers don’t have to do mental gymnastics to understand why you’re sending them a promotion, you can probably find a way to make it work. 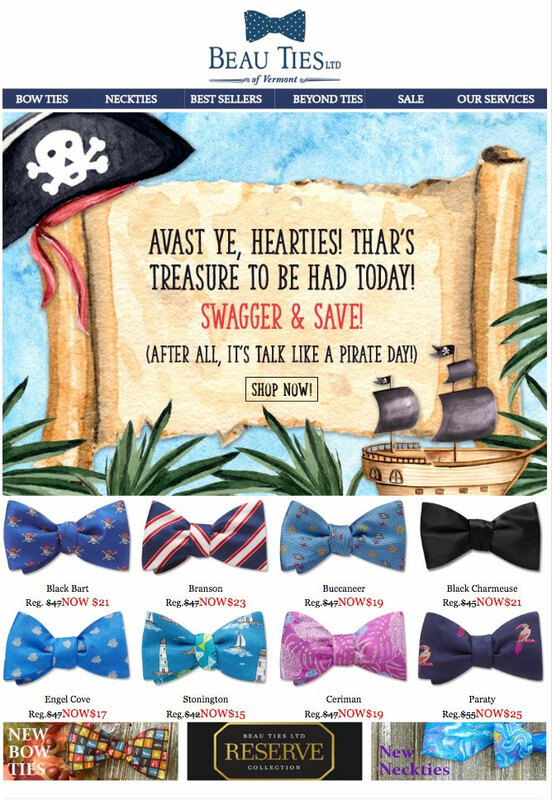 On the surface, a company that sells bow ties doesn’t seem like it’s connected to Talk Like a Pirate Day. But check out how this company used that day as a chance for a thematic email and a sale on their nautical-related products. Work on creative ways your business could tie into holidays. Think about Election Day, when companies give out free stuff if you show up with an “I Voted” sticker. These aren’t companies that have anything to do with politics or government, but they’re turning the holiday into an opportunity to draw in customers. 3. But watch out for making too loose of a connection. There are plenty of ways to tie your brand to holidays that might not, on the surface, look like natural fits. But if you play it too fast and loose with the connection between your brand and a random holiday, that’s risky. 4. Add the holidays to your email marketing calendar. Don’t get caught rushing to put your campaigns together or let holiday emails disrupt your normal email marketing schedule, so make sure you’re planning ahead. If you do some solid advanced planning, you might even be able to build hype leading up to a holiday promotion. That’s what Build-a-Bear Workshop did earlier this year. 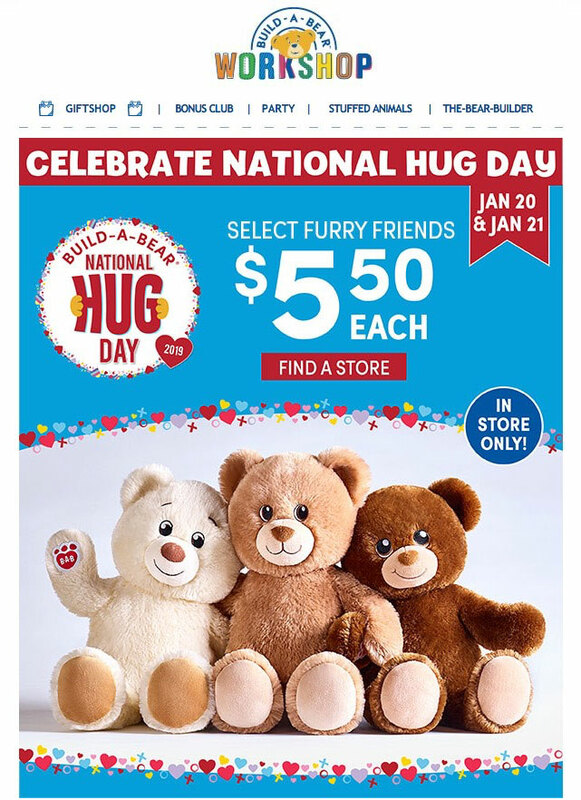 They embraced National Hug Day (pun obviously intended), sending emails to promote it on January 14th and January 19th before the day itself on January 20th. Fewer brands take advantage of obscure or non-traditional holidays than the big ones like Christmas and Independence Day, but that doesn’t mean no one is doing this. Below, find some example of non-traditional email campaigns you can use to inspire your own. According to a study into holiday email marketing from 2018, Groundhog Day emails had a spectacular conversion rate off 19.8 percent, which was five times higher than the average marketing email for the quarter. Yes, really. No, we can’t fully explain it either. 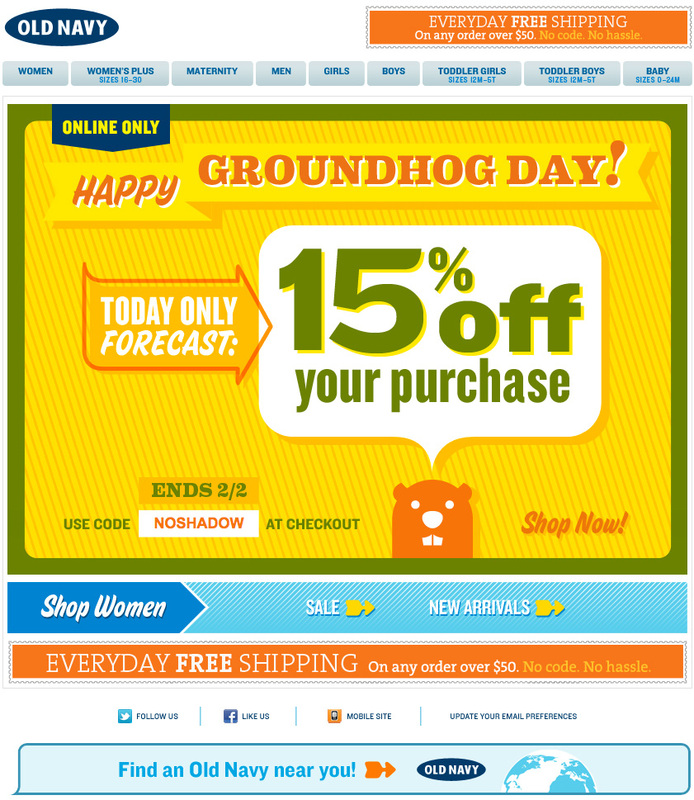 Old Navy’s Groundhog Day email uses holiday-related language (“today only forecast”) and graphics for a one-day sale. It’s also a nice touch to tie the coupon code to the result of the groundhog’s prediction earlier in the day (“NOSHADOW”). Bonobos showed off some personality responding to the groundhog’s prediction, then used his verdict of “six more weeks of winter” to push warmer clothes. That’s a very strong way to tie the holiday to a promotion. Daylight Savings Time marketing emails in 2018 had a click-to-open rate of 11.6 percent, meaning about one out of nine people who opened the email clicked through to the site. That was the highest click-to-open of any holiday for the quarter. 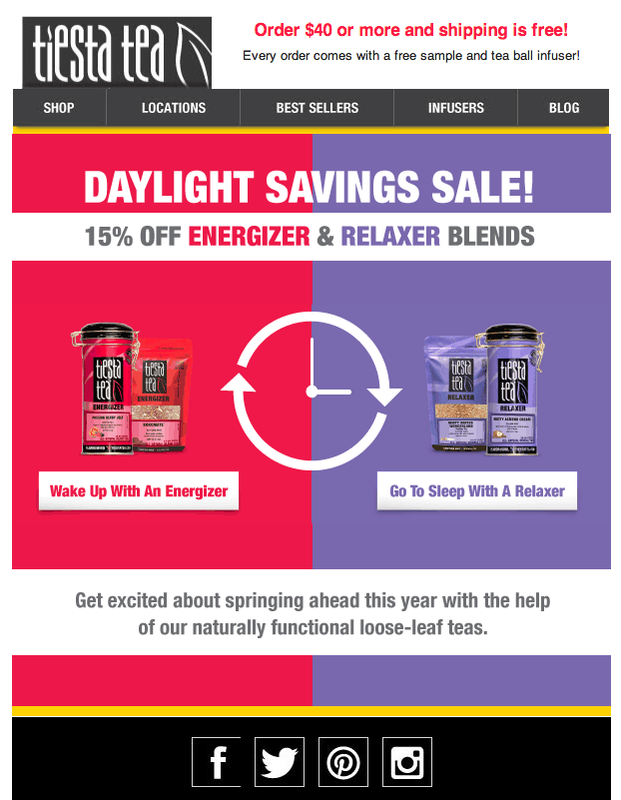 Tiesta Tea’s Daylight Savings email plays up how much the time change screws with our sleep by offering deals on blends to wake you up or help you sleep. Those are perfect products to promote for this occasion. I’d guess pretty much no one woke up the morning of the time changing thinking, “I should buy some tea to help me get through this”–but this email put that idea into their minds. 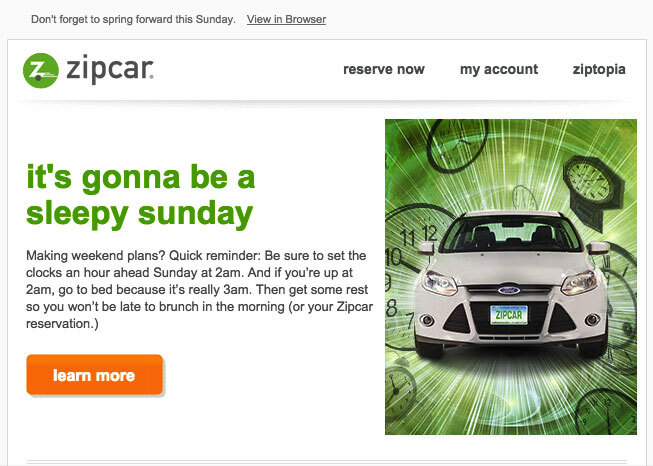 Zipcar’s Daylight Savings email has a different goal. It serves as a reminder about the time change, and helps build brand awareness and authority without advertising a sale. And if even a few people on their list think, “I totally forgot about the time change, I’m glad Zipcar reminded me,” that strengthens their positive perception of the brand in those people’s eyes. Not every obscure holiday-related email has to offer a deal, after all. This email is for the November end of Daylight Savings Time. Avon offered an “extra hour” of savings to coincide with when we set the clocks back and gain an hour. That’s an example of something any brand could do as a time change tie-in, even if you’re not selling anything related to sleep, waking up, or clocks. Emails on Pi Day in 2018 had a conversion rate of 15.9 percent–four times higher than the average email for the quarter. People sure like math puns and pi-related (or pie-related) deals. 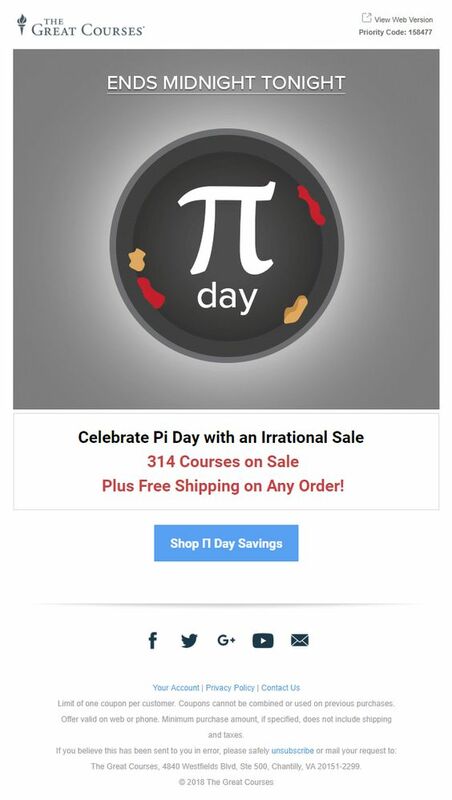 The Great Courses makes a pi joke that will appeal to their target audience (people who enjoy irrational number jokes are a good audience for online courses; I know that because I’m someone that likes irrational number jokes and I buy more online courses than I could ever finish) and puts an apropos 314 courses on sale. 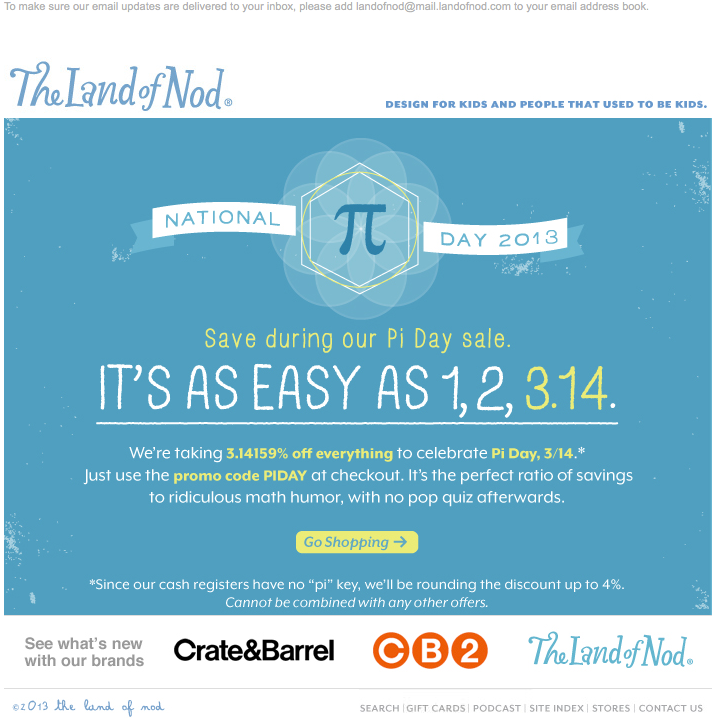 Here, the Land of Nod offers a 3.14159 percent-off sale for Pi Day. That’s not much of a discount, but it doesn’t feel like a weak discount since it’s thematic. Tax Day marketing emails last year had a click-to-open rate of 14.3 percent, highest of any emails in the quarter. 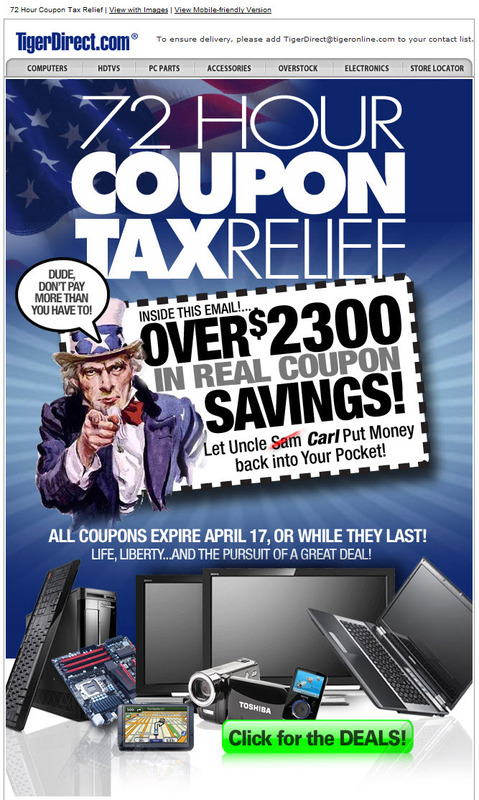 TigerDirect.com went visually aggressive with their Tax Day-imagery in this marketing email, but the verbiage (“coupon tax relief,” “over $2,300 in real coupon savings,” “life, liberty, and the pursuit of a great deal”) really does make it seem like they’re offering good deals for the holiday. There’s no ambiguity to the purpose of this email or the impetus to send it–every aspect of the presentation feels like it was designed specifically for Tax Day and not recycled from other marketing emails. 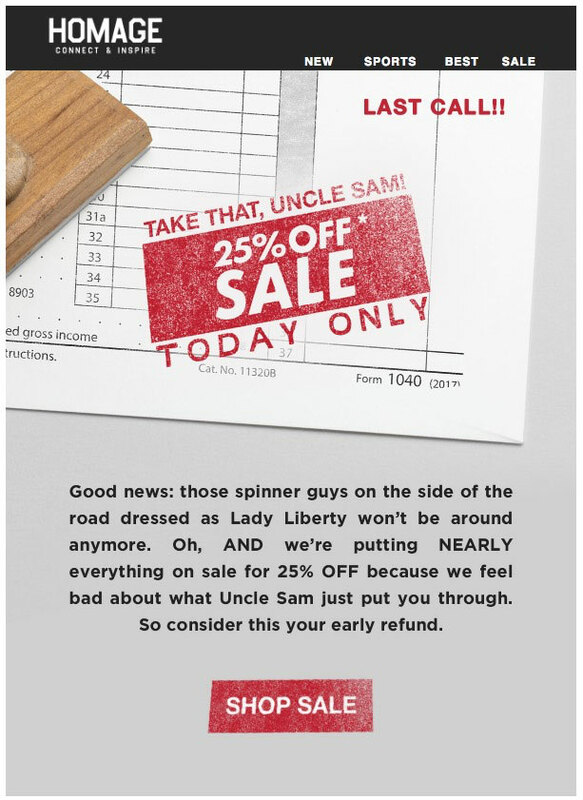 The clothing company Homage commiserates with the pain of tax day, demonstrates some personality, and explicitly offers a Tax Day-inspired sitewide deal because “we feel bad about what Uncle Sam just put you through. So consider this your early refund.” This is a good case of a company that has nothing to do with taxes, tax software, or anything government-related finding the right way to capitalize on the holiday and bond with its customers. Earth Day emails in 2018 had a 4.3 percent conversion rate, which was the highest of any spring emails. 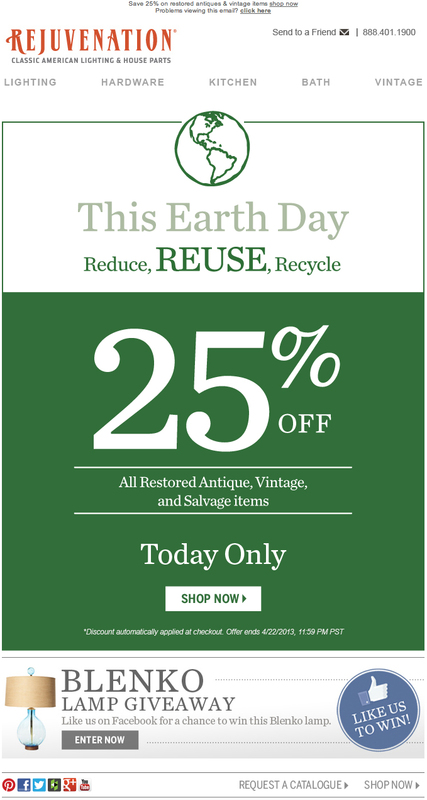 Earth Day is, obviously, a natural tie-in for any store that sells eco-friendly products. Rejuvenation makes sure to point out their reclaimed, recycled, and second-hand products are eco-friendly–then offers a discount on them. 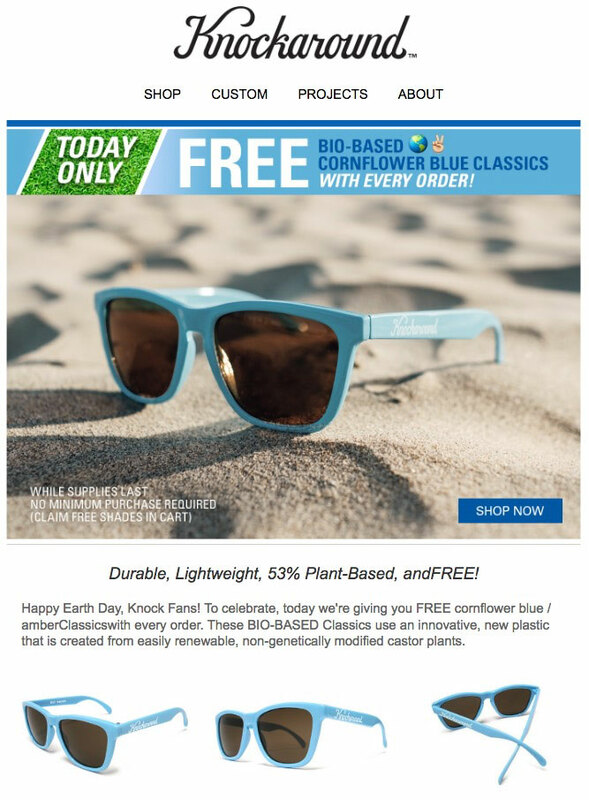 On a similar note, I’d bet Knockaround had a very strong sales day by offering a free pair of bio-based sunglasses with every order. That’s a very enticing offer that fits in perfectly with Earth Day. Can you celebrate Earth Day if your company isn’t known for selling green products? Absolutely–you can use it as a chance to demonstrate your eco-conscious side. Here, Tiffany & Co. uses its Earth Day email to talk about its environmental charity work and green efforts. Christmas in July is old news. Retailers are much hotter these days on trying to recreate the Black Friday magic in July. And… customers aren’t rebelling against it. Marketing emails advertising Black Friday in July last year had a 12.7 click-to-open rate and 3.3 percent conversion rate, meaning people were actually pretty into what is clearly just a blatant cash grab of an imaginary holiday. So if you are going to promote Black Friday in July, the way to mitigate a potential backlash from your customers is: Offer great deals. Deals like the ones you’d offer on the actual Black Friday. 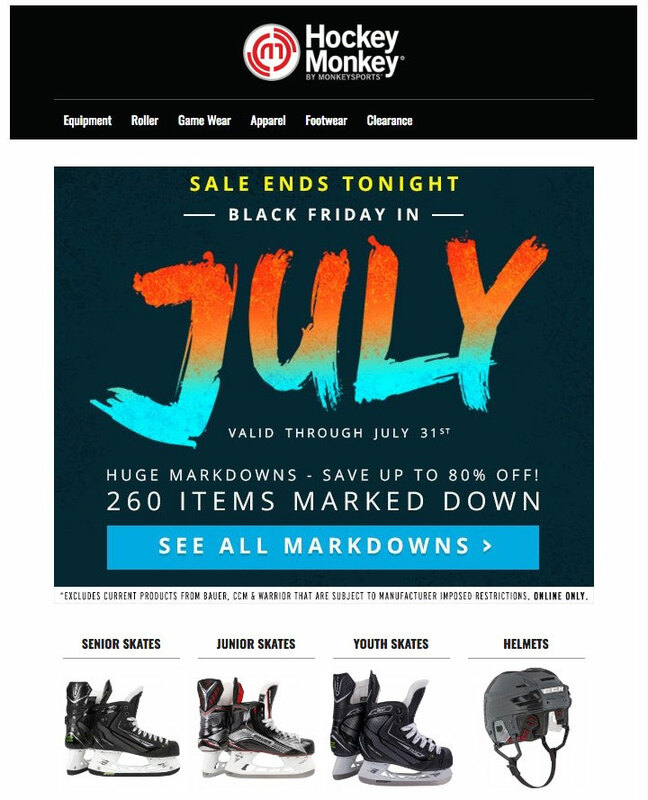 In this email, Hockey Monkey offers big-time markdowns for their Black Friday in July sale (which was probably required to move any ice hockey equipment in the middle of summer). Wayfair sent a Black Friday in July email with a top-notch design. It’s so well done I find myself more drawn to the products than to the ridiculousness of the concept of Black Friday in July. Notice they also use the familiar “doorbuster deals” phrase from the real Black Friday to help sell the whole bit. 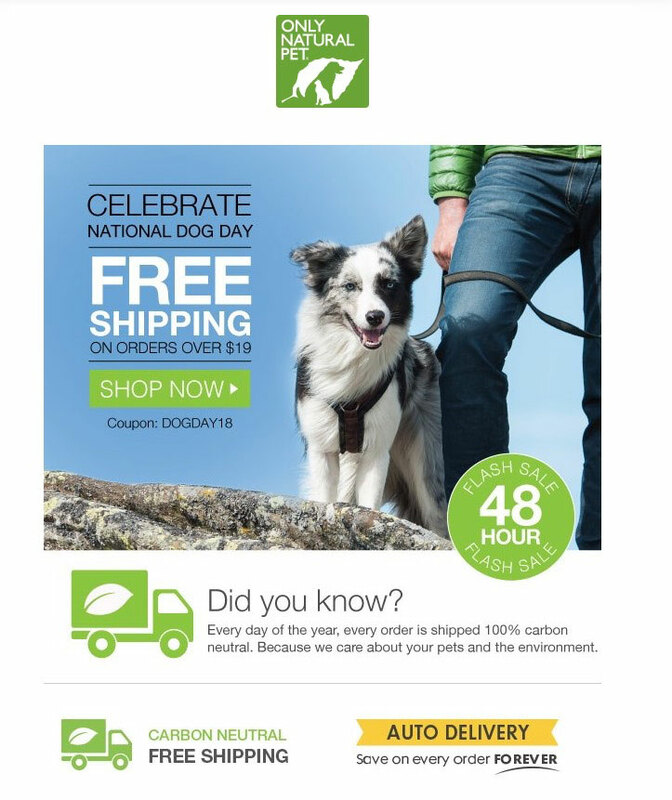 Obviously if you run any sort of pet-related business, National Dog Day is a no-brainer occasion to send out a marketing email and run a promotion. But even if you aren’t a pet company, you can still tie yourself into the holiday. Kay Jewelers–which rational people would agree is not a dog- or pet-oriented business–still found a way to tie National Dog Day to a promotion. And, in the process, they might’ve even figured out a new avenue to get people to buy jewelry: in honor of their dogs. Oktoberfest is an aspirational holiday for Americans–why can’t we come up with a culturally-relevant month-long beer-and-accordion holiday? So it’s no wonder that in 2018, Oktoberfest emails had a 22.2 percent open rate–higher than any of the other non-traditional retail holidays featured in this article. 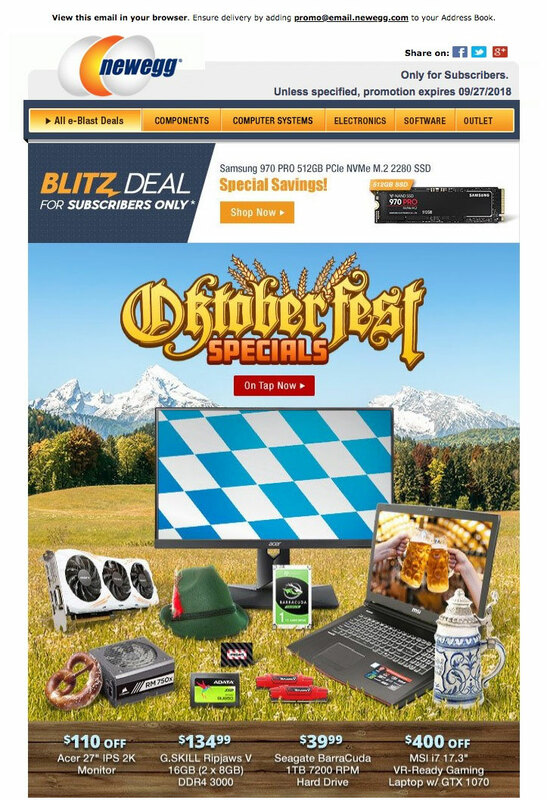 Newegg, on the other hand, doesn’t have anything even remotely Oktoberfest-related in its electronics shop. But they still found a way to send a marketing email capitalizing on Oktoberfest by Photoshopping their products into a Bavarian field, adding the traditional blue-and-white checkerboard pattern and beer mugs toasting onto the screens, and randomly throwing a beer stein, hat, and pretzel into the image. You could replicate this technique for whatever you sell with a little bit of image editing–and since Oktoberfest emails have such high open rates, that effort could really pay worthwhile. People love coffee almost as much as they love their dogs, so this is another good unofficial holiday to jump on. The stats back it up, too: In 2018, National Coffee Day marketing emails had the highest click-to-open rate of any of the non-traditional retail holidays at 23.9 percent click-to-open rate, turned that into a very good 6.9 percent conversion rate. If you’re in the coffee business, you shouldn’t just get in on National Coffee Day–it’s also a time to bust out a serious offer, like Forto here giving away free six-packs of coffee with “no strings attached.” That shows you’re not just capitalizing on National Coffee Day, you’re celebrating it. Because people take coffee (and, perhaps by extension, the faux holiday ecosystem surrounding it) seriously. Bare Minerals is in the makeup business, not the coffee business, but they still found a way to make a National Coffee Day email work. 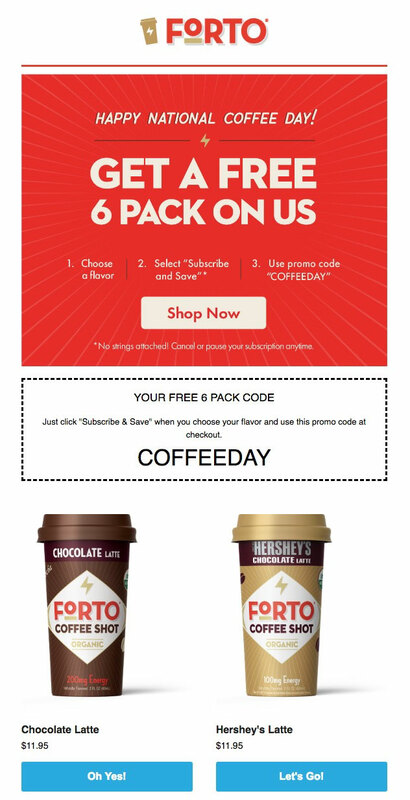 Between using a picture of a coffee mug, making some coffee puns in their copy, and focusing on coffee-colored makeup, this email feels like a natural fit for National Coffee Day–even though it’s from a company not selling anything close to coffee. There are hundreds of holidays beyond Christmas and the other traditional retail holidays like Halloween and Valentine’s Day. And if you approach them right, they provide great marketing opportunities. They give you a trigger and a purpose for sending a marketing email. They give you a good opportunity to offer a sale. They give you a chance to be topical. And they give you an opportunity to show off your brand’s personality. So when you’re putting together your email marketing calendar, it’s worth doing a deep dive into non-traditional retail holidays. First off, find the holidays that are perfect fits for your brand. After that, look for holidays you’d want to celebrate but are more “brand adjacent” than on the nose, and think of creative ways you can link your brand to those holidays. Just be careful not to take it too far, since a specious connection to a holiday could be a turn-off to your subscribers. Sam Greenspan is a writer based out of El Segundo, California, where he has great views of both the Pacific Ocean and Chevron refinery. He's a veteran blogger as well as a board game inventor, t-shirt collector, and guy that random people instinctively stop on the street for help fixing their phones and computers.